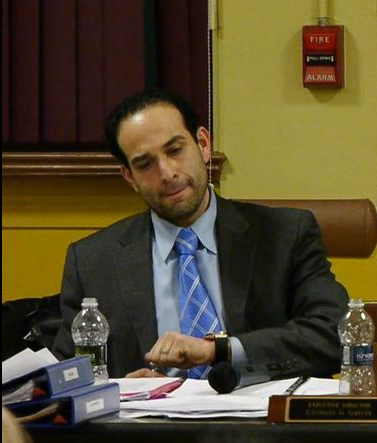 MSV: HHA contract issues and a threat inside the HHA: "Someone needs to be shot"
HHA contract issues and a threat inside the HHA: "Someone needs to be shot"
Part Two of MSV's exclusive coverage of the Hoboken Housing Authority meeting last Thursday. The Hoboken Housing Authority meeting last Thursday once again elevated issues surrounding the agency's procurement policies highlighted with a two year contract bid for boilers in the buildings. The previous contract was issued in December 2011 to Hauser Inc., identified in an earlier MSV exclusive as contributing thousands of dollars to HHA Executive Director Carmelo Garcia last March. The Hauser Inc. 2011 contract running two years was issued for a not exceeding amount of $469,000. Actual payments continued after the end of the contract with no required emergency approval(s) from the HHA Board of Commissioners. With the work orders through Hurricane Sandy, the final tally came in at $1.3 million. The failure to properly vet emergency actions with acceptable federal procurement policy is what triggered closer observation into the HHA procurement practices under HHA Executive Director Carmelo Garcia. Further review shows HHA expenditures outside of the federal procurement rules in the millions of dollars on a cursory review of HHA vendors. Putting aside Hurricane Sandy complications, Hauser lowered their own two year bid by a very substantial $161,000! Would this lower bid have occurred if Hauser was the sole bidder (and a contributor giving thousands of dollars to Carmelo Garcia) and working off no properly HHA board approved contract at all? The size, scope and details of the previous two year Hauser contract can not be compared against the proposed one as Carmelo Garcia has not responded to requests making the contract documentation available. During another point in the meeting, Chairwoman Dana Wefer identified AM Construction as yet another HHA vendor that has given Carmelo Garcia money. She said no contracts should be placed before the HHA Board of Commissioners who have contributed money to Carmelo Garcia's political committee. Mister Carmelo was not pleased about this and whined ... Well most political observers at this point are well aware of his whining. who enrich him with thousands of dollars. Fallout: Word on the street coming from one Carmelito displeased with any possible impact on their political standing within the HHA is telling associates in her sweet velvety voice, "Someone needs to be shot." The person they envision at the end of a bullet is the long suffering Jessica Coco who dared to voice a view counter to the politically permitted one in the HHA that Vision 20/20 was a scam, not only on the City of Hoboken and its residents but the people living in the HHA. While talk of violence has been directed at Coco repeatedly with bonafide evidence of death threats reaching this editor and less than veiled threats inside the City Council chambers at the recent special HHA meeting, the latest escalation mirrors the increasing revelations of misdeeds within the agency. Talking Ed Note: Please don't say anything about this to Beth Mason. MSV doesn't want to see another verbal assault on Ms. Coco by the hyper political councilwoman who may need to travel to Washington for another conference on women's rights.